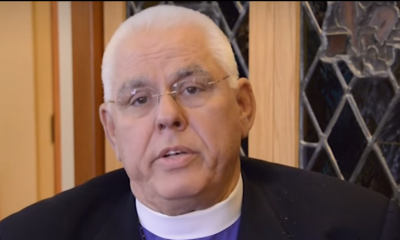 An Episcopal bishop has been sanctioned by the denomination for attempting to sell a church property despite the congregation opposing the move. An Episcopal Church hearing panel imposed a sanction on the Right Reverend J. Jon Bruno, bishop of the Episcopal Diocese of Los Angeles on Saturday, prohibiting him from selling the St. James property, while the panel considers disciplining him over the property sale case. "If the Respondent has entered into a contract to sell, or sold, the St. James property before the Hearing Panel has decided the case, that conduct is disruptive, dilatory and otherwise contrary to the integrity of this proceeding," wrote the Rt. Rev. Herman Hollerith IV, president for the hearing panel. "Acting under the authority of Canon IV.13.9(a), the Hearing Panel accordingly imposes the following sanctions on the Respondent, acting individually, or as Bishop Diocesan, or as Corp Sole, or in any other capacity: Respondent is prohibited from selling or conveying or contracting to sell or convey the St. James property until further order of the Hearing Panel." A native of Los Angeles, Bruno was ordained as an Episcopal priest in 1978 and became the sixth bishop of the Los Angeles Diocese in 2002. At issue in the case is the property of St. James the Great Episcopal of Newport Beach. The property had been previously won in a legal case against a 700-member Anglican congregation that broke away from the diocese over theological differences. In May 2015, Bruno announced that he was selling the property of St. James the Great for $15 million to Legacy Partners Residential, which planned to build 22 townhouses on the real estate. The sale announcement went against the wishes of the fairly new congregation that began to use the church property following the legal battle. The Orange County Register reported in July 2015 that parishioners were locked out of the property and prevented from accessing items like choir robes and Communion items. "We were blindsided," explained one St. James member to the OC Register in 2015. "I am stunned the leadership of the diocese is so eager for condos instead of this congregation." In late March, Bruno underwent a three-day hearing over his actions in Pasadena, California. A ruling has not yet been issued on the accusations against the bishop. The Facebook group "Save St. James the Great Newport Beach-Episcopal" posted a comment Saturday commending the "swift action" of the hearing panel. "Our gratitude for the Hearing Panel's action is unending and we will keep you posted as information develops," stated the group.